I knew sooner or later that I would use Ms. Hill on this website, but this song seems pretty applicable right now to my life. It's all in keeping with the theme of change and just letting things flow, not pressing anything. I learned that if you keep pressing things and you keep trying to push for something that doesn't need to be pushed for, that thing that you want so bad will eventually be pushed out of your life and away from you forever. I mean I've always knew that, but I just lost that piece of knowledge in the wake of me "acting up" as I like to call it. But as I sit back and start to look at all of the things that are going on with my life and deciding what's important and what's not important, I realize that the things that I want don't require the extra work and attention, rather they just need some room to grow and do their own thing. So right now, I'm just chilling and worrying about my life and what I'm trying to build, My Kingdom. A lot of the time stress is the ultimate killer, you worry yourself into the ground about something that doesn't need to be worried about and you over analyze everything. When that happens, you start judging yourself too hard, you start over doing things and most importantly, you start acting out of fear of failure. That's the mindset you need to get out of when you're dealing with trying to be a better person, you just over think period. It's not until I realized that things are going to happen regardless of how much you try to prevent it or protect it, that's life. The only thing that you can do is learn to accept that which cannot be control and what can be controlled and that's your actions. That's why people are so keen to look at the person rather than the situation, because they know that life gets crazy sometimes, it's just the manner at how the person going through it acts. That's why I just stopped trying to do any and everything to win, that was never my motivation. I was always that guy who took life as it was and made adjustments, I always knew not to expect anything, but hope for everything. That hard work was essential to the dream completion, and that everyone doesn't stick around in your life, so enjoy them and the memories while you can. That was me in a nutshell basically, just loving and experiencing life as it came. I was lost, and got away from that path, but now I'm back on it, and it's been everything and more to me. I'm not completely happy at the moment, but I'm feeling myself get closer and closer to that feeling. I have plans in place and things I want to do, so with that planning and preparation that I talked about in My Kingdom, I'll be fine. But it all started with the thought of "everything is everything, what is meant to be, will be". That thought process will probably be the saving grace in my life at some point, knowing that it will help me get what I want out of it. I'm glad this song randomly played today on Songza because it was kind of right on time with everything else that has been going on around me. It reminds me to just chill out and that everything is everything, and what happens is because it's supposed to happen. Life isn't that bad as people make it seem or want it to be; I always just enjoyed going different places with my friends and family, that's it. No special banners, bells or whistles, and I'm just getting back to that. 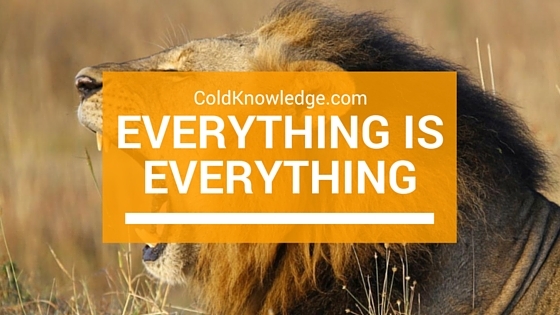 What do you think about the way of thinking "everything is everything"? Do you agree or do you feel like there's something more to it than that? Let me know in the comments below.